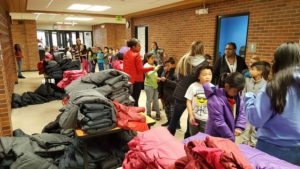 Just in time for possible record low temperatures this weekend, hundreds of central Iowa school children received free winter coats this morning. UnitedHealthcare donated the coats to Des Moines’ Samuelson Elementary School. Pashion Muhammad, the school’s community coordinator, was thrilled when she first learned about the project. Muhammad said. As students picked out their coats this morning, a sign outside of the school indicated the temperature was 29 degrees. UnitedHealthcare officials say in recent months the company has also donated money to build playground facilities in Davenport and Ottumwa, supply winter clothing to students in Sioux City and Waterloo, provide “summer vacation kits” to students in Cedar Rapids, and back to school supplies to students in Davenport.